We can find art in Alzheimer’s disease. Life does not stop with a diagnosis of dementia: with the right support, living well is not tokenism, it is possible. There is a recent surge of new diagnostic modalities and therapeutic options for many neurologic conditions. As a result and combined with the time constraints and regulatory requirements that neurologists (and all health care professionals) face, this can create situations in which detailed disease management, rather than the healing potential within the provider-patient relationship, directs clinical encounters. For conditions without effective treatment or cure, placing clinical interactions firmly within such a therapeutic relationship may be especially important. Alzheimer’s disease (AD) and related dementias can be particularly treacherous ground for neurologists. In addition to having no cures or consistently effective treatments to offer, neurologists also may lack the training or experience to field questions posed by caregivers, often on the theme of managing challenging behaviors. Likewise, neurologists may not fully understand the plight of the caregiver and so may be unable to offer informed advice that could ease the burden of caregiving, which in turn can improve the quality of life for persons living with dementia. First-person accounts that could educate neurologists on what it is like to live with dementia call to mind unconscious biases neurologists may harbor regarding patients with dementia, suggesting that targets for care and support are scarce in the medical literature on AD. In a 2014 New York Times essay, Danielle Ofri, MD posited possible causes for this phenomenon, including physicians’ frustration at the lack of effective treatments and time constraints and the existential and emotional aspects of themselves they may not be aware of or may tend to avoid.4 Burnout affects up to 60% of neurologists and produces impairments in judgment, poorer patient outcomes, and increased likelihood of patient objectification.5 Burnout also may affect the ability to follow through in breaking of bad news and may inhibit the expression of empathy and compassion in clinical encounters. Numerous persons living with dementia have communicated with the authors of this article about the negative impact their interactions with neurologists have had on them, especially when receiving the diagnosis of dementia. In 2 recent national conferences (Dementia Action Alliance in 2017 and American Academy of Neurology in 2018), there have been panel discussions of persons living with early-onset dementia from various causes. The interactions these individuals describe often are characterized as lacking empathy, compassion, or acknowledgement of fundamental personhood with poor eye contact and communication skills of the neurologist, ignorance or poor communication of available resources, and a perceived lack of effort or concern to help patients live well with their diagnosis. Interactions such as these may have far-reaching consequences, including undermining trust in physician-patient relationships, negatively affecting treatment plan compliance, and affecting patients’ perceived self-worth and caregivers’ well-being. 1. Arrange for the participation of a primary caregiver during diagnosis discussion. 2. Provide adequate uninterrupted time and a proper office space. 3. Make a specific diagnosis, unless cultural, educational, or other factors dictate otherwise. 4. Make the diagnosis a process that occurs over several office visits. 5. Counter nihilism and despair by focusing on remaining abilities: frame the challenge as one of achieving the best life possible while accommodating the limitations. 6. When sharing the diagnosis, it is recommended that the physician position himself or herself as a partner of, and advocate for, the patient and caregivers. 7. Set realistic expectations for treatment. 8. Initiate early comprehensive treatment, including psychosocial interventions. 9. Educate patient, caregiver, and other family members about Alzheimer’s disease in stage of disease–appropriate manner, using all available educational resources. 10. Inform the patient and caregiver(s) of available services and encourage their utilization; provide in-office materials and website addresses. 11. Emphasize to the caregiver the importance of attending to his or her own emotional and health care needs and facilitate access to resources. 12. Address commonly occurring issues proactively, especially if safety related. Attention to sense of self and relationships are of primary importance when caring for people with cognitive impairments. Recognition and acceptance of a persistent sense of self among people living with dementia is the prerequisite for person-centered care, with inherent ethical implications supporting deference to those living with dementia regarding decision making, autonomy, and self-determination. Acknowledging that identity and selfhood occur in a reciprocally relational context, some dementia care professionals and researchers are reframing person-centered care as relationship-centered care.8 The premise is that optimal care and support are achieved when all involved parties (ie, the person living with dementia and his or her family and professional care partners) experience a sense of security, continuity, belonging, purpose, achievement, and significance in the shared goal of living well with dementia. Neurologists are often consulted to make or confirm a diagnosis of dementia of a specific cause, and this may become increasingly true given the new diagnostic paradigm of the 2018 National Institute on Aging-Alzheimer’s Association (NIA–AA) Research Framework. The NIA-AA framework distinguishes AD from Alzheimer’s clinical syndrome by the presence or absence of biomarkers.12 This puts neurologists in a critical position to influence the tone and trajectory of care, starting with the diagnosis. Although tailored to primary care providers, most of these guidelines are appropriate for neurologists. Of particular importance is to “counter nihilism and despair by focusing on the functional capabilities that remain and framing the challenge as one of achieving the best life possible while accommodating the limitations of the disease.”13 More than 1 clinical interaction may be required because of complexities and demands of sharing the diagnosis and the potential psychologic and emotional impact it may have. It is important to explicitly name the diagnosis and provide ample educational resources and information on support services available to counter the shame and stigma associated with insufficient knowledge.13 Ancillary staff can collate these resources and make them available to patients and caregivers in a postdiagnosis meeting, as is often done effectively in oncology practices. Direct communication with persons living with dementia that maintains eye contact and avoids emotional reactivity is essential. Neurologists should approach patients from the front at eye level and pose questions slowly, clearly, and singly, with ample time for unprompted responses.14 Caregivers can and should be queried, as well, but not as surrogates for the person living with dementia. We recommend that even in cases of advanced disease, the physician give the same deference, respect, and attention to a person with cognitive impairments that they would give to a person without cognitive impairments. Although accurate historical data may also need to be provided by caregivers, the effort to avoid regarding persons living with dementia as anything less than complete human beings preserves their innate dignity, personhood, and unique narratives. 1. Provide me with the diagnosis of dementia promptly and with compassion and support. 2. I am your patient. Please talk to me and not my care partner instead. 3. Provide me with written information about the type of dementia I have and with resources to peer groups. 4. Encourage me to participate in peer groups. 5. Understand that I am LIVING WITH dementia and need your support. 6. Encourage me to continue doing things that are enjoyable and meaningful. 7. Inform me about effective compensatory strategies others use when abilities change. It is important for neurologists to offer hope by emphasizing that life goes on despite dementia, and that self-expression and maintenance of relationships are essential for well-being. Supporting strengths and minimizing losses within a loving, trusting, accepting, and validating social framework creates a safe environment where persons diagnosed with dementia can be empowered to live to their potential. Neurologists should educate patients and caregivers from within this type of dementia care paradigm. Creative arts therapy. A growing body of research shows that expressive arts and creativity counterbalances social stigma for people diagnosed with dementia by building a social and emotional framework for strength-based living.19 Art therapy, music therapy, drama therapy, poetry and bibliotherapy, and dance therapy combined with reminiscence and storytelling have numerous beneficial effects including fostering dignity, preserving a sense of self-worth, and improving quality of life.20 Trained and credentialed therapists in these disciplines work in a defined clinical relationship with clients to support personal and relational treatment goals and promote well-being, resilience, and joy in the creative process. Neurologists should recommend these therapies and consider making referrals when feasible. Art therapy improves attention, pleasure, behavior, and affect in patients with dementia.21 Other benefits include enhanced self-esteem, improved communication and reduced anxiety, agitation, and depression.21 Art therapy for patients with dementia is typically provided to small groups of patients in a clinical or care setting by a registered art therapist. Therapists can be found through the American Art Therapy Association. Figure. Lester and Albert by Lester E. Potts. Creative arts programs can help maintain relationships for patients with dementia. The painting on the cover and the Figure were painted by Lester E. Potts, Jr, father of neurologist, Daniel C. Potts (see About the Cover Artist). The Figure depicts an original watercolor painted when he was experiencing mid-stage AD. Participating in art therapy improved his communication and behavior, elevated his mood, and helped preserve his relationships, restoring a sense of pride and self-worth. His treating physicians helped their patient live well by referring him to a dementia daycare center offering expressive arts therapies. 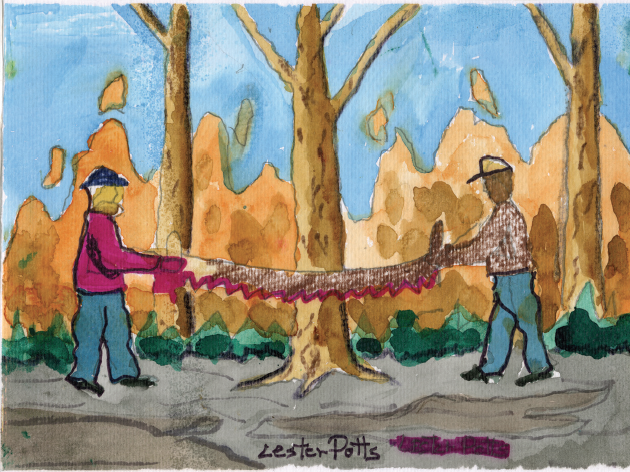 The painting shown, Lester and Albert, depicts Potts with a fellow sawmill worker and friend, exemplifying the transcendent power of relationships in the face of advancing dementia. Neurologists should make many of the same recommendations for maintaining brain health to persons with dementia and their caregivers as they make to other patients (eg, physical exercise, a brain- and heart-healthy diet, good sleep habits and assessment and treatment for sleep apnea, treatment of mood disorders, avoidance of smoking and excessive alcohol intake, controlling vascular risk factors). Furthermore, neurologists should encourage patients and caregivers to attend to spiritual wellness through prayer, meditation, sharing in faith groups, and other spiritual practices. Neurologists are in a unique position to promote a more compassionate culture in dementia care, from the time of diagnosis all the way through to end of life. By considering the voices of those who are living with dementia and their caregivers; seeking to honor the dignity and personhood in every human being, despite conditions or circumstances; making the commitment to educate themselves, staff, patients, and caregivers; and positioning themselves as partners and advocates in relationship-centered care models, neurologists can play an essential role in helping patients with dementia and their caregivers live as well as possible. 1. Morgan J. Living well with dementia. Lancet. 2018;17(4):306-307. 2. Alzheimer’s Association. 2018 Alzheimer’s disease facts and figures. Alzheimer’s Dement. 2018;14(3):367-429. 3. Hamilton J. Many Doctors Who Diagnose Alzheimer’s Fail to Tell the Patient. Shots Health News from NPR. https://www.npr.org/sections/health-shots/2015/03/24/394927484/many-doctors-who-diagnose-alzheimers-fail-to-tell-the-patient. Published March 24, 2015. Accessed May12, 2018. 4. Ofri D. The Silence of Doctors Around Alzheimer’s. The New York Times. https://well.blogs.nytimes.com/2014/05/08/the-silence-of-doctors-around-alzheimers/. Accessed May 12, 2018. Published May 8, 2014. Accessed May 12, 2018. 5. Busis NA, Shanafelt TD, Keran CM, et al. Burnout, career satisfaction, and well-being among US neurologists in 2016. Neurology. 2017;88(8):797-808. 6. Phinney A. Living with dementia from the patient’s perspective. J Gerontol Nurs. 1998;24(6):8-15. 7. 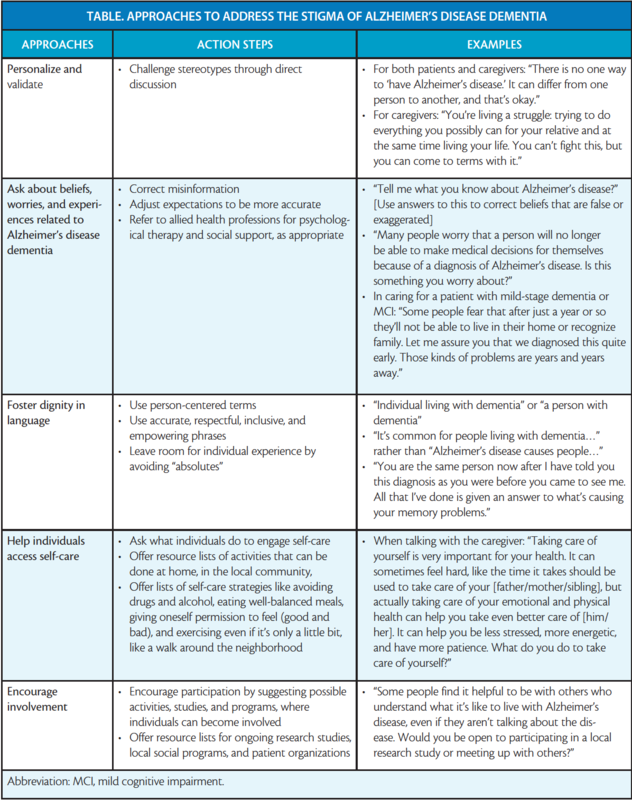 Reed P, Bluethmann S. Voices of Alzheimer’s disease: a summary report on the nationwide town hall meetings for people with early stage dementia. Chicago, IL. Alzheimer’s Association; 2008. 8. Reed P., Carson J., Gibb, Z. Transcending the tragedy discourse of dementia: an ethical imperative for promoting selfhood, meaningful relationships, and well-being. AMA J Ethics. 2017;19(7):693-703. 9. Fazio S, Mitchell DB. Persistence of self in individuals with Alzheimer’s disease: evidence from language and visual recognition. Dementia (London). 2009;8(1):39-59. 10. Chatterjee, A. The Neuropsychology of Visual Art. Oxford University Press, 341-356. https://repository.upenn.edu/neuroethics_pubs/140. Published July 15, 2016. Accessed May14, 2018. 11. Clare L, Nelis SM, Quinn C, et al. Improving the experience of dementia and enhancing active life - living well with dementia: study protocol for the IDEAL study. Health Qual Life Outcomes. 2014;12:164. 12. Jack, Jr CR, Bennett DA, Blennow K, et al. NIA-AA Research Framework: toward a biological definition of Alzheimer’s disease. Alzheimer’s & Dementia 2018; 14: 535-562. 13. Grossberg GT, Christensen DD, Griffith PA, et al. The art of sharing the diagnosis and management of Alzheimer’s disease with patients and caregivers: recommendations of an expert consensus panel. Prim Care Companion J Clin Psychiatry. 2010;12(1):PCC.09cs00833. 14. Potts, EW, Potts, DC. A Pocket Guide for the Alzheimer’s Caregiver. Tuscaloosa, AL: Dementia Dynamics; 2011. 15. Principles for a Dignified Diagnosis. (773-10-0003). Chicago, IL: Alzheimer’s Association. June 2016. 16. Dementia Action Alliance. Top 7 Things Doctors Need to Know to Enable and Not Disable a Person Living with Dementia. https://daanow.org/wp-content/uploads/2018/05/DAA-DoctorBookmark_Final.pdf. Accessed May 16, 2018. 17. Logsdon R, McCurry S. Evidence-based interventions to improve quality of life for individuals with dementia. Alzheimer’s Care Today. 2007;8(4):309-318. 18. La Bey L. Alzheimer’s Speaks website. https://www.alzheimersspeaks.com/memory-cafes. Updated May 17, 2018. Accessed May 17, 2018. 19. Bienvenu B, Hanna G. Arts Participation: counterbalancing forces to the social stigma of a dementia diagnosis. AMA J Ethics. 2017;19(7):704-712. 20. Potts DC, Miller BL, Prickett, CA, et al. 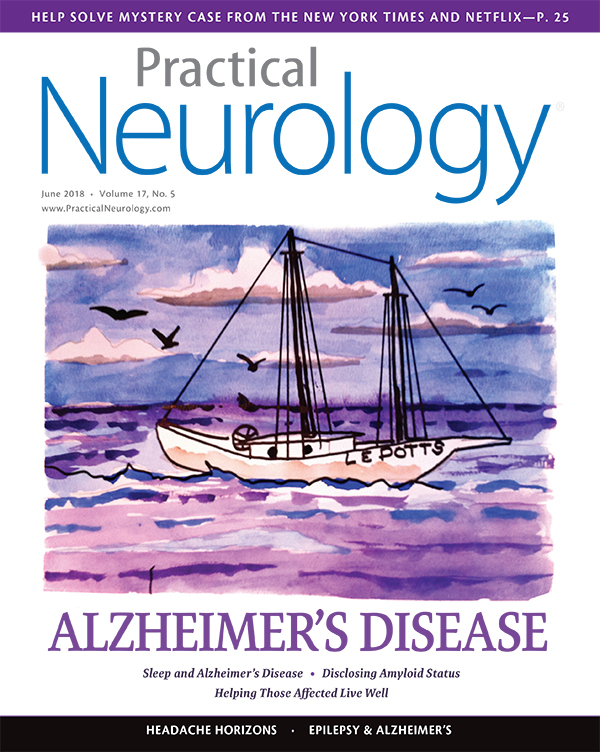 Expressive art therapies in geriatric neurology. In: Nair AK, Sabbagh MN, eds. Geriatric Neurology. Hoboken, NJ: John Wiley & Sons, Ltd;2014:630-643. 22. Potts DC, Duncan, AC. Cognitive Dynamics website. http://www.cognitivedynamics.org/cognitive-connections/. Updated May 16, 2018. Accessed May 19, 2018. 23. Barnard D, Yaffe MJ. What is the physician’s responsibility to a patient’s family caregiver? AMA J Ethics: Virtual Mentor. 2014;16(5):330-338. 24. Odenheimer G, Borson S, Sanders AE, et al. Quality improvement in neurology: dementia management quality measures. Neurology. 2013;81:1545-1549. 25. Gitlin LN, Hodgson NA. Who should assess the needs of and care for a dementia patient’s caregiver? AMA J Ethics. 2016;18(12):1171-1181. Erenumab approval heralds a new era in headache medicine. Clinicians can address the challenges of stigma in routine clinical practice. Providers should have a high index of suspicion for seizure disorders in patients with Alzheimer’s disease.